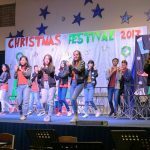 In an up and down battle that saw the lead change 3 times in the final quarter, the Wells Seahawks faced their toughest challenge so far but eventually held off the girls from Traill International School in a non-conference game on Tuesday afternoon. Both teams set up a stifling defense that resulted in a very low-scoring first half. At the break, Wells led by just a point, 6-5. Things got more interesting in the second half as the offenses took over, settling for a tie at 14-14 going into the final quarter. The teams continued to trade baskets until the final minutes of the game when, driven by the cheers of the home crowd, Wells pulled away to the final score of 24-20. Wells was led by the two-guard tandem of Gunita Anandsongvit (10) and Kanny Smith (8), both scoring 6 points each. The Seahawk Basketball Season continues next week with TISAC conference play against St. Andrew’s International School on Tuesday, September 29, Charter International School on Wednesday, September 30, and ASB on Thursday, October 1. 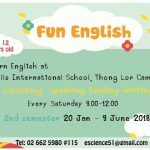 Ad: Summer Science and ESL Courses at Thong Lor Campus!